The Cessna Company of Wichita, Kansas has been responsible for the most successful family of civil light aircraft designs in the history of aviation. The Cessna 310 was the first of the successful twin engined commuter aircraft designs produced by the company. First flown in 1953 the Cessna 310 proved to be very popular in Australia and over 70 have appeared on the civil aircraft register. The Museum’s Cessna 310, VH-AER, is an early model that has had a varied history. It was originally owned by Utah Mining, and later it was used to carry out the first rain making experiments in Australia with the CSIRO. This involved the seeding of clouds with iodine crystals. While owned by Masling Airlines it came second outright in the 1969 England-Australia BP Air Race. Its last owner was a South Australian doctor. 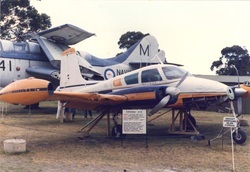 In 1982 the aircraft was badly damaged in a take off accident on Kangaroo Island off the South Australian coast. It was subsequently donated to the Museum that same year.